강진 정수사 석가여래삼불좌상은 목조좌대에 쓰인 묵서를 통하여 향좌측의 소조불좌상이 조선시대 1561년에 조성되었고, 중앙과 향우측의 목조불좌상이 조선시대 1648년에 조성된 것임을 알 수 있다. 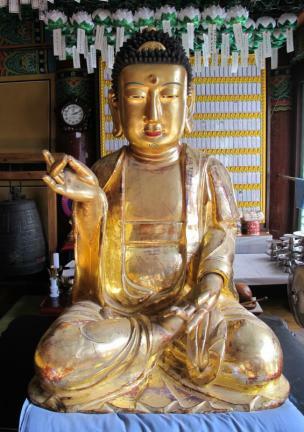 향좌측의 소조불좌상은 묵서에 따르면, 지금까지 밝혀지지 않은 조각승 태보(太宝)와 사담(思淡)에 의해 1561년에 조성되었다는 것을 알 수 있으며, 다시 1648년에 화원 승일(勝日) 등 7명의 조각승에 의해 중앙과 향우측의 불상이 조성될 때 다시 중수되었다는 것을 알 수 있다. 비록 석가여래삼불좌상 중 1존이 나머지 2존과 조성 시기가 다르다고 하더라도 이러한 조성 양상마저 당시 임진왜란과 정유재란 등 시대적인 상황을 반영하는 불상 조성 방식의 일면을 보여준다는 점에서 의미가 있다고 하겠다. 또한 향좌측의 소조불좌상이 일부 보수되긴 하였지만, 전체적으로 보존상태가 양호하여 조선시대 불교미술연구에 있어서 기준작이 된다는 점에서 가치가 크다. 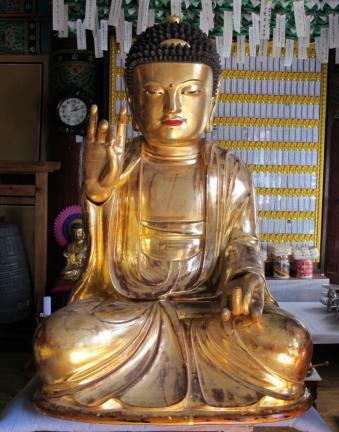 The postscript written on a wooden pedestal on which one of the Seated Sakyamuni Buddha Triad of Jeongsusa Temple is placed reveals that the molded bodhisattva on the left dates back to 1561, while the wooden statues of the principal Buddha and the other attendant on the right date to 1648. 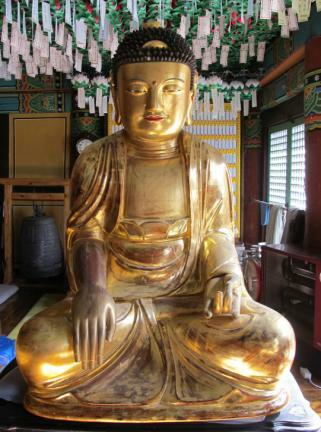 The record also shows that the molded statue was created by two unknown monk-sculptors named Taebo and Sadam, and that it was renovated in 1648 when the other two figures were made by a team of seven monk-sculptors led by Seungil. The fact that the triad is composed of works produced at different times shows a deviation from the norm, but it is historically significant in that it reflects the turbulence Korea suffered after the Japanese invasion of 1592 and the ensuing seven-year war.